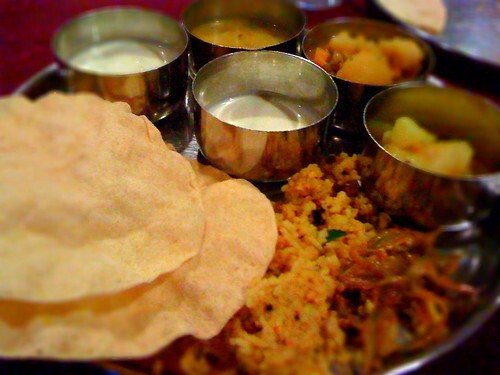 I came to know of the restaurant Annalakshmi through the Channel 5 program, Buffetlicious. It is just another typical Indian vegetarian restaurant if not for it's "Eat What You Want and Give As You Feel" philosophy made possible by the service of voluntary staff. Yes, you read it right! There's no fixed price for the food charged in the restaurant. Simply pay whatever price you feel is right or affordable to you! Despite the airing of the program on national television and the 'reassurance' from the restaurant's website, it still sounded too good to be true to me. Hence, a trip was made to the branch at Chinatown Point. Upon arrival at the restaurant slightly after noon, I was expecting to find it crowded with hungry customers looking for a cheap deal. On the contrary, it was not even half-full and only after being attended by a polite waiter did I realised that the tables were all fully reserved. I was about to make my hasty retreat in disappointment but was instead offered a reserved table with the condition that I free it in an hour's time. The deal was struck and after being shown to my table, I was delighted to be offered a list of drinks ranging from lassi, pineapple juice, lime juice etc other than plain water! The buffet spread didn't really have the "wow" factor unlike it's hotel counterpart. Nevertheless, with a choice of 4 different types of rice, some 5 to 6 varieties of accompanying gravy, fried lady's finger, papadam (my absolute favourite! ), sweet yoghurt dessert and freshly-cut water melon, it definitely more than satisfied my hunger pang on a Sunday afternoon. Note: For those naan-lovers, it's only available during the dinner buffet. Lunch buffet (11am - 3pm) and dinner buffet (6pm - 9pm) at Chinatown Point are only available from Friday to Sunday. Reservation (6339 9993) is highly recommended.